Whoosh! Summer raced by, with renovations on our house, and helping out on renovations at our daughter and son-in-law’s house and weaving, weaving, weaving, weaving, weaving! I’ve been working HARD on new books and am hunkering in and am ~FINALLY~ getting them closer to completion and releasing- oh my! I took a little break from my looms the other evening to indulge in a little bit of upcycling. My daughter in law gave me some of her torn blue jeans a few months ago. I have a couple of dress patterns that I am besotted with these days, and find myself making them over and over in various configurations. In my previous blog post, (link to post) I showed how I used my fave dress pattern with fabric that I had woven on various narrow looms. 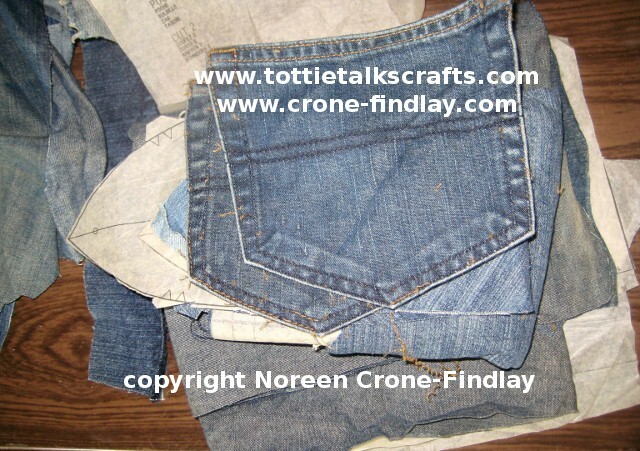 Snipping up the bluejeans to fit the pattern pieces was a touch tricky, and forced me to bend a few ‘good seamstressing’ rules, but what the heck, why not? 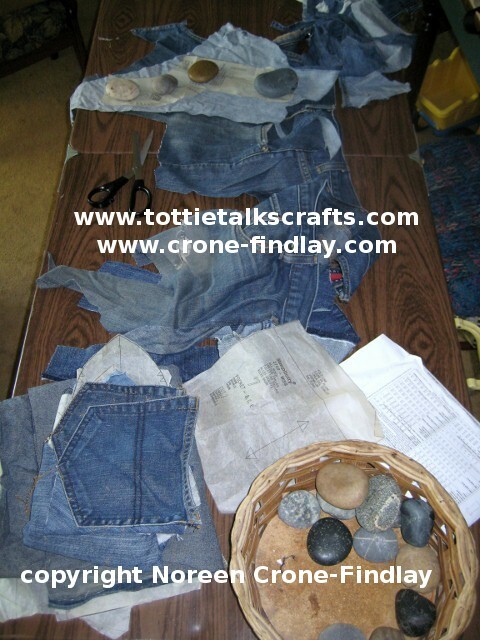 I am fanatical about pinning the living daylights out of the sections of garments when I am stitching them together, but I don’t pin my pattern pieces to the fabric when cutting out. I like my rock collection that I have gathered up over the years. 🙂 They hold things in place without damaging the pattern tissues. And, of course, I HAD to save and re-use the bum pockets! I also saved a little pocket from the inside of one pair for a cellphone or glasses mini-pocket, too. 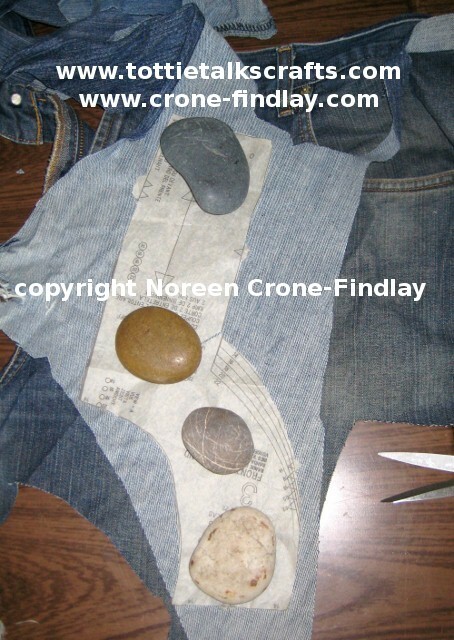 Unfortunately, when I picked the pockets off the backside of the jeans, there were 2 dark blue pocket shapes. Drat! 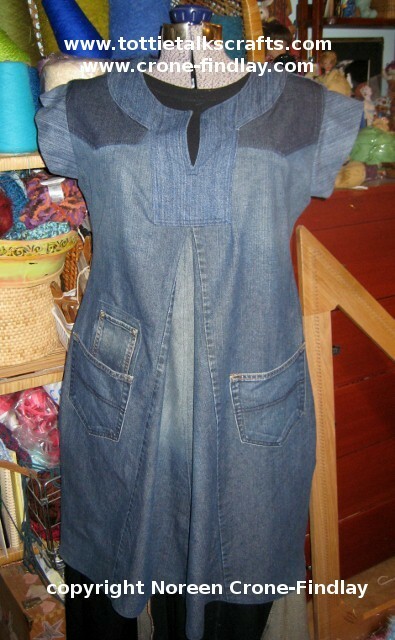 I am tickled pink with my upcycled denim dress, and am so happy that a couple of pairs of torn jeans have come back to life as a fun and comfy tunic that I am going to enjoy enormously! Whee! I really should show you the dress that I made from a garage sale tablecloth… it’s great! I wove the neckband…. okay… must take pictures and get back into the habit of blogging again! And, by the way…. Happy September!